"The Masters of Inevitability (Shattershot Part 2)" / "Angel of Death" / "The Roots of the Past"
Mojo II sends his agents, the Death Sponsors, to Earth, in order to capture Arize and boost their pirate ratings by doing what Mojo failed to do. 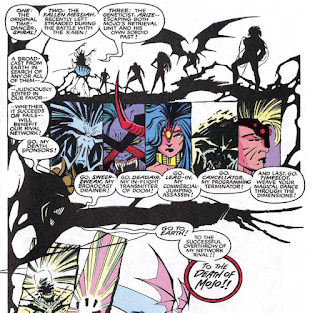 Meanwhile, the X-Men battle Apocalypse in a Danger Room scenario meant to test them in a no-win scenario, a situation which highlights Bishop's unique approach to combat. 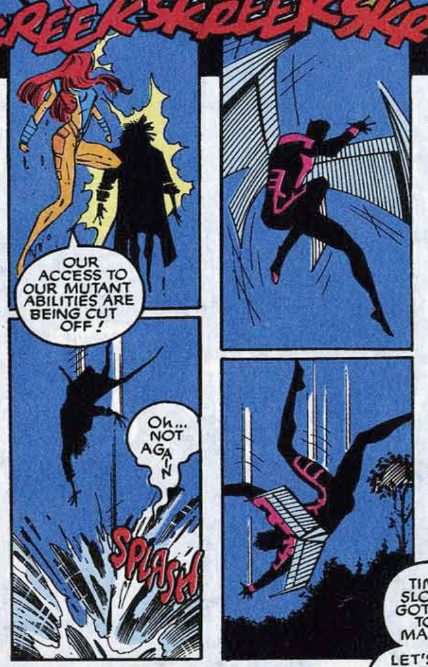 Later, Jean is attempting to put back together Arize's fractured memories when the Death Sponsors attack. In the course of the battle, Arize's memories are restored, and Bishop is able to disrupt the Death Sponsors attempt to escape, sending them back to Mojoworld without Arize, Now knowing that he's responsible for the terrible state of Mojoworld, Arize goes off on his own, resolving to discover what is right about Earth in order to learn how his world has gone wrong. 2nd Story: During a fight with a terrorist group wearing Mandroid armor, Archangel is injured and visited by a mutant named Amalgam, who has the power to absorb the powers of minds of other mutants. 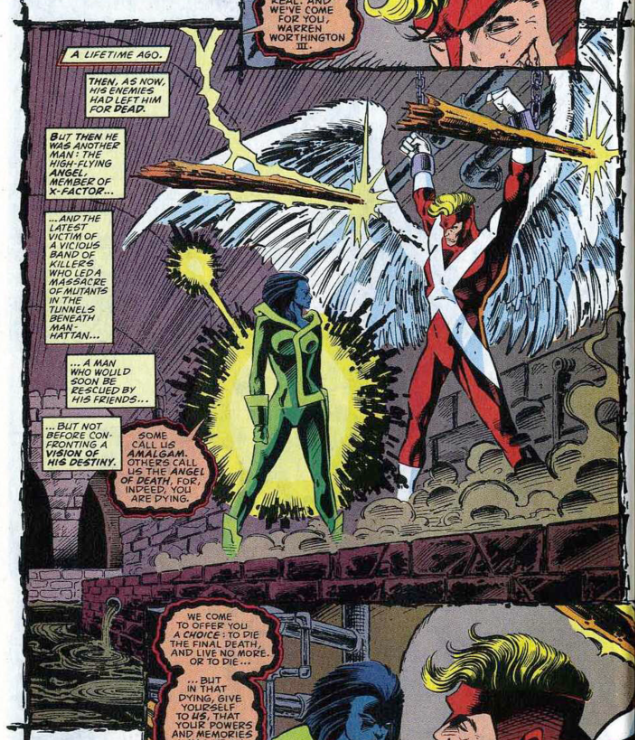 Her presence reminds him of when he first met her, during the Morlock Massacre after his wings were injured. She attempted to absorb his mind then, but using Destiny's power, realized it wasn't time for him yet. In the present, Archangel wakes up back in the X-Mansion, and learns that the terrorists have given up in the wake of their leader's death. 3rd Story: Bishop laments to Storm about how different the past is compared to what he knows from his timeline, where the only thing which remains of the X-Men's home is a massive oak tree that doesn't exist in the present. He then falls asleep, and the next morning wakes to see that Storm has planted a small oak tree in the spot where the larger tree stood in his timeline. This issue introduces the Death Sponsors, aka Mojo II's minions. Their names are all plays on TV industry lingo, and while that certainly fits the general schtick of Mojoworld, don't bother trying to remember any of these guys, cuz they have yet to appear again. 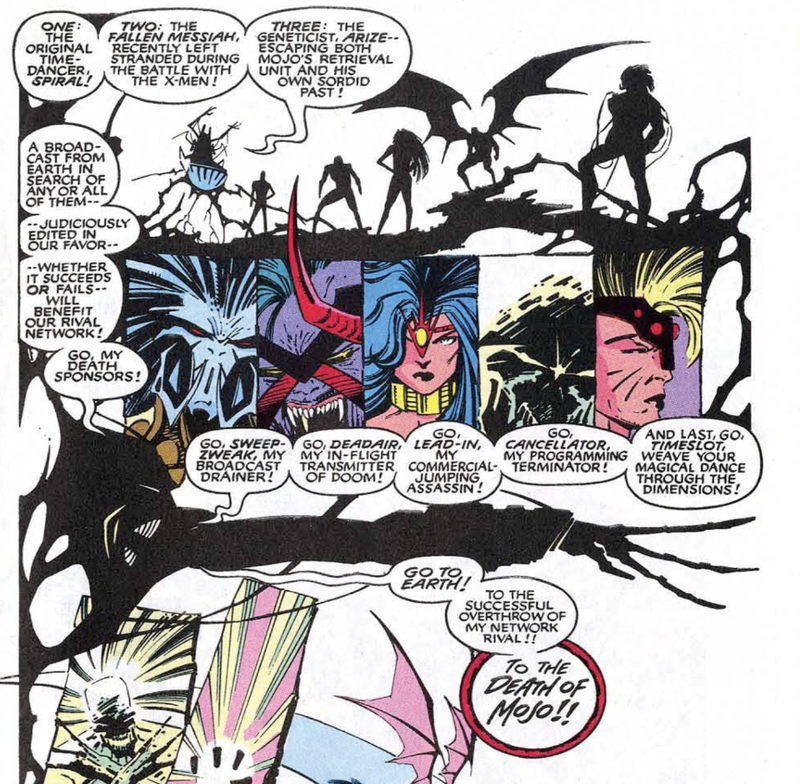 Mojo II mentions there's three Mojoworld natives on Earth whom the Death Sponsors can try to capture as a rating stunt: Spiral (who is the subject of the next chapter of the story), Arize, and the fallen messiah, which presumably means Longshot. But if I'm following my Longshot chronology correctly, at this point, he's a captive of Mojo, as seen in X-Men #7. A narrative caption points out that while the X-Men are based out of a school for gifted youngsters, they don't really go to school anymore and aren't all that young; it's possible this was something of a bugaboo for Nicieza, since he'll eventually rechristen the existing school as the Xavier Institute for Higher Learning after Generation X starts up and the Massachusetts Academy gets renamed the Xavier School for Gifted Youngsters (a change I wholeheartedly endorsed, then and now, since he's right, the X-Men are almost laughably at this point not really students or youngsters in any traditional sense). The issue ends with Arize declaring he needs to go off on his own and find himself, make amends, etc., which is a not-uncommon ending for these kinds of stories, but one which always crosses by "suspension of disbelief" threshold. So, like, where is this wild haired extradimensional alien man going to go? How's he going to get there? Where will he sleep? How will he have money to buy food to eat or do anything else? He just walks off at the end of the issue, with the clothes on his back. The X-Men don't give him some starter cash, or a lift into a town, or even a hobo's bindle filled with cans of beans. Sure, it's more dramatic this way, but all that drama goes away the second you start to think about what happens on the next, unwritten, page. With the previous annual covering 1992's "Top Villains" backup story, this issue gets two additional backup stories. The first, also by Jae Lee, features Archangel encountering a villain named Amalgam who looks like Mystique and is wearing Rogue's old costume. It attempts to suggest that she was present when Warren was crippled by the Marauders during "Mutant Massacre" (and flashes back to scenes set during that story", but I don't think she ever appears again, nor is this story ever referenced again. The third story is actually a nice little character vignette which also continues the "Bishop acclimates to the present day" plotline and deepens his relationship with Storm. There's also the usual assortment of pinups, once again of fairly high quality for this sort of thing. Fabian Nicieza continues the story, coming over from X-Men Annual #1 (and apparently just copy/pasting his plot from that issue). 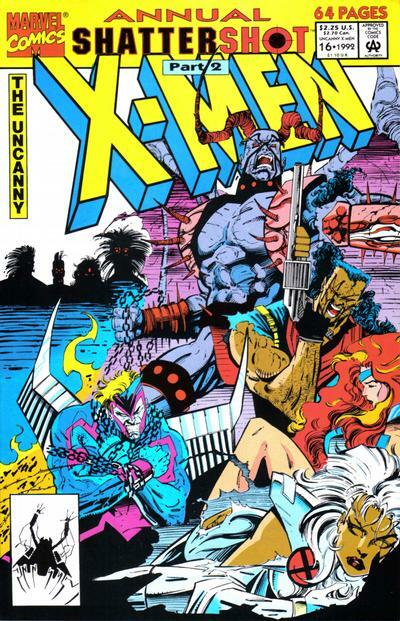 Art comes from Jae Lee, who will shortly fill-in on X-Factor during "X-Cutioner's Song", and who we last saw finishing up Rob Liefeld's Beast story in Marvel Comics Presents, . Mojo II appears briefly in this issue, once more in shadows, and depicted as looking not unlike Mojo, at least in profile. Not sure if that was a deliberate feint (since Mojo II turns out to be bipedal), or just that no one had yet to settle on how the character would look (or bothered to tell Jae Lee), and Lee just assumed he'd look like Mojo. 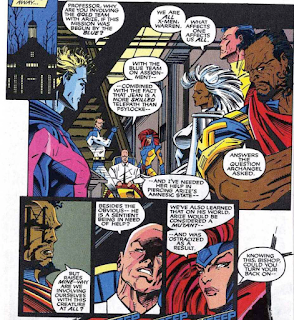 Calming some of the X-Men's concerns, Professor X points out that Bishop isn't all that different in terms of differing styles and temperament than Wolverine was when he first joined the team. I can't remember if this was made explicit in the Longshot limited series or not, but Arize reveals here that he programmed a Messiah Imperative into Longshot, in an attempt to spark a rebellion against Mojo. The Gold team questions why they're now dealing with Arize when it was the Blue team that brought him, and Xavier responds that they're all X-Men, while also adding that Jean's stronger telepathic skills relative to Psylocke are needed, an appreciated acknowledgement in-universe of the necessary handoff in a story like this. 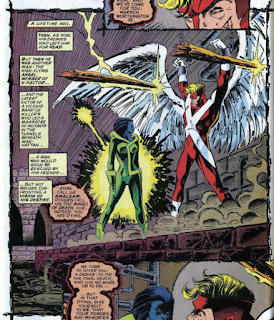 When one of the Death Sponsors cancels the X-Men's powers, we see Archangel's wings retract into the "tuning fork" on his back, from the old X-Factor days. 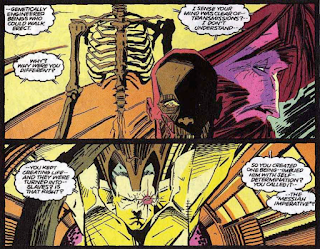 It's suggested that Arize is as much a mutant as the X-Men, for his desire to see a different way of life come to pass on Mojoworld, but I'm not sure how literally we're meant to take that idea (it's a bit like how Warlock was a mutant because he didn't want to fight his dad to the death). In the second story, Angel is depicted during the Mutant Masscre as having been impaled by wooden stakes through his wings, when in fact it was a pair of Harpoon's, uh, harpoons. Also, he hallucinates Beast as being blue and furry, he even though he was "normal" Beast at the time of the massacre. Then again, it's a hallucination, so there's some wiggle room there. Continuing "Shattershot" in the most perfunctory way possible, the focus pivots to the Gold team now that Arize is back at the X-Mansion (a shift that is at least acknowledged within the comic itself). From there, the plot is pretty much a rehash of X-Men Annual #1, with a different group of Mojoworld denizens sent by a different Mojo to retrieve Arize and a different group of X-Men fighting them off. Even the structure is similar, opening with scenes on Mojoworld, then featuring a Danger Room session, then the fight against Mojo's goons. Two specific elements set this apart, and keep it come being completely pointless. For one, Nicieza gets some mileage out of Bishop's continued acclimation to his current surroundings, and read a certain way, this could be as much a continuation of that ongoing plotline as it is a continuation of the more obvious "Shattershot" plot (the whole "was he bluffing? He was! No, he wasn't!" routine in the Danger Room is a nice sequence to that end, if a touch overly-cute). The other standout is the Jae Lee art, which, while lacking the finer points of the Sienkiewiczian style it so clearly evokes (it's a lot more static, the backgrounds a lot more bland/non-existence), is still energetic and fun to look at it. As sequential art, it's not the greatest, but just by dint of being different than a lot of other art at this time, it helps enliven what is otherwise a very ho-hum, almost beat-for-beat rehash of the story's, also largely ho-hum, introductory chapter. Tomorrow, Spiral targets Arize in X-Factor Annual #7. Friday, "Shattershot" concludes with X-Force Annual #1. Next week, Bishop meets Gambit in X-Men #8. I mean, really, like you said; I’ve no idea how his journey figures into the rest of “Shattershot” or any stories down the line, but that just makes no sense. How does Cable have nothing to do with this? [wipes off hands] Mission accomplished! I started zoning out / mentally flipping through much of this — Mojo stuff generally + the Claremont-lite (aping the style with very little of the substance) palaver full of supposedly clever names and slang and concepts = not for me, thanks — which is a shame if only because the story has points to make about Bishop relevant to the ongoing series/franchise. "But if I'm following my Longshot chronology correctly, at this point, he's a captive of Mojo, as seen in X-Men #7." 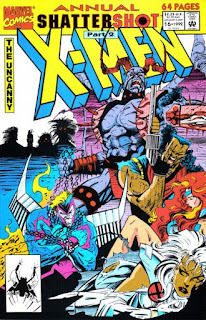 "the X-Men are almost laughably at this point not really students or youngsters in any traditional sense"
Tell that to Bob Harras and Jim Lee. "Mojo II appears briefly in this issue, once more in shadows, and depicted as looking not unlike Mojo, at least in profile. Not sure if that was a deliberate feint (since Mojo II turns out to be bipedal), or just that no one had yet to settle on how the character would look (or bothered to tell Jae Lee), and Lee just assumed he'd look like Mojo." I'm going with behind-the-scenes confusion. Also, Mojo II seems much more malicious in these stories than he will in Volume 2. His goal seems to supplant Mojo more than it is to overthrow him and set up a much more benign system, no? "while also adding that Jean's stronger telepathic skills relative to Psylocke"
"Continuing "Shattershot" in the most perfunctory way possible"
So it qualifies as cromulent? As a stand-alone chapter, it is decent, but as with much of Shattershot, it just doesn't jell together as a long story. I will say the art is nice, as far as early Jae Lee art goes. And I like the Bishop we get in this story. He's intense and extreme, without being the over-the-top EXTREME! we get via Liefeld. He seems to accept the X-men's way but goes about doing things his own way. I wish we kept getting this Bishop, instead of the sourpuss we ended up getting who is either thinking about the X-traitor storyline or giving one of his "In the future, this is different in this way" lectures. As for the Deathsponser...eh. not too memorable. Though poor Storm and Colossus, they really don't come off well at all during the fight with them.